Black Vintage Leather Curved Arm Chesterfield. 3 Seater Chesterfield Sofa in Black. Upholstered in our beautifully soft black vintage leather for the finest of finishes. A unique blend of gorgeous flared rolled arms, classical tub feet and stitched and pinned border base all combine to create a standout piece amongst the S.W.James collection. In its 3 seater black vintage leather form shown here, the sofa provides ample space for family living, whilst the dark colouring provides a robustness to withstand day to day family life. Elegant, spacious, and completely unique. The 3 seater variant provides space aplenty and is a joy to sink into, the No.3 truly is a stand-out sofa. 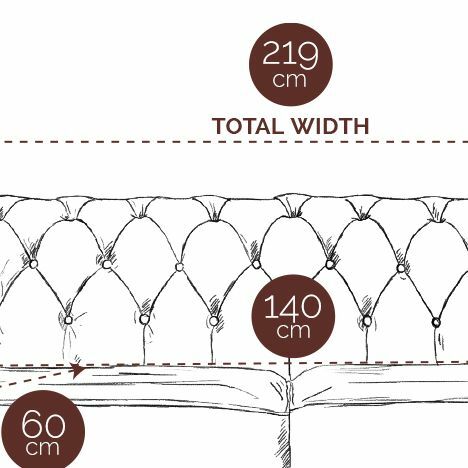 Upholstery is available in both a range of leather and wools – and you’ll love it in which ever option you choose. 2 Soft cushions overlay a simple single buttoned border on the base, whilst its arms roll wide to welcome you back home. 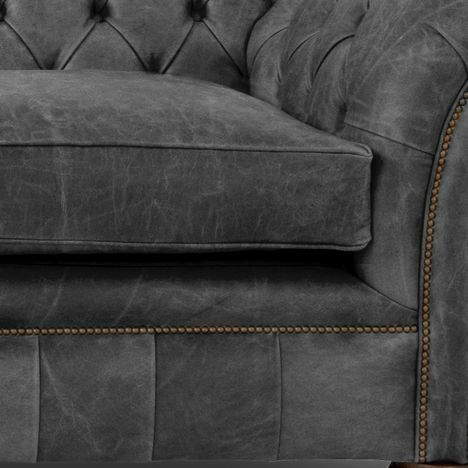 One of our favourite designs, it remains sympathetic to the traditional chesterfield design whilst providing a more contemporary edge especially when finished in one of our fine British wools.